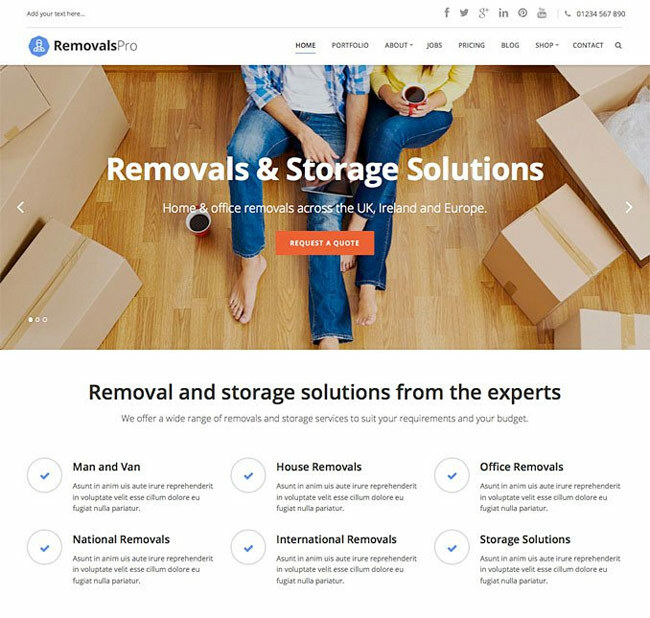 A collection of the best responsive WordPress theme for moving companies, relocation services and logistics businesses. All themes are easy to set up and use. It provides a simple road-map to create a website looks great on any devices. Best Responsive Transportation & Logistics WordPress theme for Logistics, Cargo, Transport and Shipping companies 2017 can help you transform website into a unique business selling tool. To save your time events we have listed most unique Moving WordPress themes covered all necessary functions and abilities for moving company or transportation business. All are fully Responsive, Unlimited layouts and easy to customize. Some one also includes easy to use and fast page builder. All themes compatible to every device, from smartphones and tablets to desktop. Etalon is a easy-to-use WordPress theme, ideally suited for small business owners, entrepreneurs and business professionals. This is just a glimpse of what websites variations you can achive by using the theme: Barber Shop, Beauty Salon, Car Rental, Catering, Cleaning, Construction, Dentist, Driver, Elder care, Fitness , Gardener, IT Service, Mechanic, Moving, Vet. Theme comes packaged with the premium Visual Composer and Revolution Slider add ons. Tons of shortcodes will make building your website like a walk in the park. Etalon features 15 completely different, clean designed demo homepage templates for business professionals. By following the simple one click installation process, you can replicate any demo homepage variation and get started working on your website right away without ever having to write a single line of code yourself. Install posts, menus, pages and sliders. Etalon’s theme options panel is designed to simplify the development of any website. You can control every section of the theme without having to write a single line of code! Logistics is a cleverly designed and luminously bright, powerfully flexible and amazingly versatile, serious and professional, modern and fresh-faced, reliable and user-friendly, technologically articulate and highly aesthetically conscious responsive WordPress theme specially designed for the cargo, warehouse, trucking, logistics, shipping, transportation and all freight services. Logistics integrated with amazing features and modern functionality, the Transport theme will ensure that your business is going to make the most of establishing an online presence. Unique and enticing page layouts are really making the logistics standout from others. There are 8 portfolio pages, 6 blog pages, services, about pages, transportation, and infrastructure with excellent design, lets you perfectly expose the main purpose of the website. When it comes to aesthetic customization, the Visual Composer page builder tool has you covered. It simplifies and streamlines the process, while providing you with many personalization options. With Logistics theme you can even cater to an international audience, given the inclusion of the WPML plugin, along with .po and .mo files. A translatable page is more likely to attract visitors, making your content more accessible. Simple & Elegant has extensive technological capabilities, with wonderful widgets like the Slider Revolution, MailChimp, Shortcodes, Social Media widgets with custom stylings and working out of the box. Logistics is built on the latest valid HTML5 and CSS3 with W3c validation, fully responsive and retina ready to give the opportunity for the customers to reach you via mobile and handheld devices. This means your site is updated to the latest technology and coded with semantic coding and built in with SEO techniques for higher rankings by the search engines. With tracking function your customers can track their order from anywhere in World. Try Logistics now! 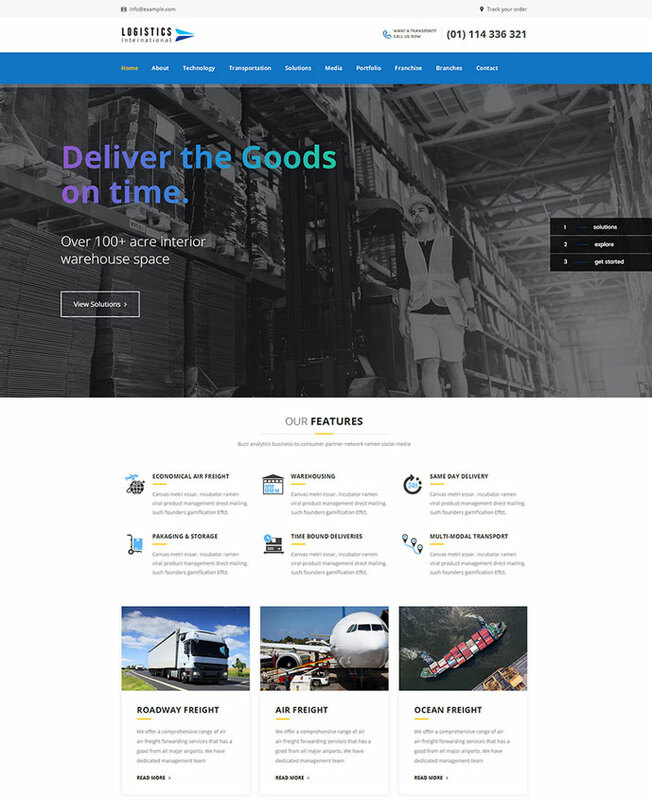 Unload is an impressive WordPress logistics theme for cargo, courier, shipping company, trucking, warehouse and logistics services. This theme include price calculator form lets visitors specify direct dimensions of the package, including its weight, and the distance that it needs to travel to the final destination, your customers can book their rides directly from the website based on different ratios that you typically charge for. Unload is the result of an elaborate and careful design and development process by a dedicated team of professionals working to provide webmasters with an easy and intuitive platform for putting together sophisticated, functional websites in the blink of an click. It has more than 2 demo homepages, 4 Services Listing Styles, 6 gallery listing styles, 9 custom post types, 5 header styles and 3 blog listing styles. Among them you will find one dedicated to own style only with the premium Visual Composer drag and drop page editor plugin lets you commandeer the look and feel of your website without having to write a single line of code yourself. Get the possibility to use Layer Slider for your image posting and photo galleries. With plentiful SEO capabilities, Unload has no trouble getting your business noticed. A powerful Theme options allows Total to completely shift its appearance and behavior through a completely intuitive visual interface. Its responsive nature makes it perfect for appealing to audiences across all platforms. That goes a long way towards maximizing your reach. With Unload your logistics business will thrive! 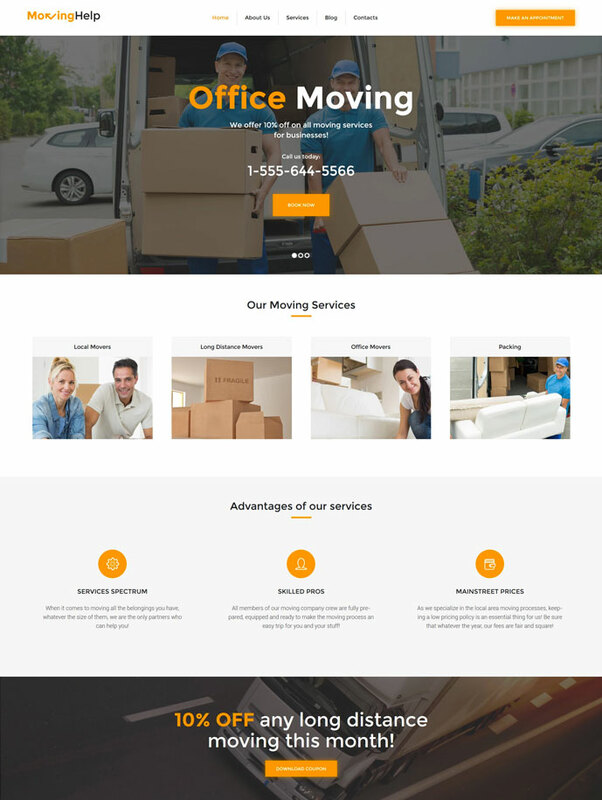 Moving Help is a flat and clean, aesthetically accomplished and technologically cutting edge, incredibly versatile and flexible, fully responsive WordPress Theme, this theme is great website template for logistic, trucking services, transportation, and cargo shipping companies. With Power page builder included provides for seamless website development without touching a line of code, you can switch content modules in a drag-and-drop mode. Dozens of readily available, professionally designed page templates and layouts, as well as independently certified security features, make Moving Help a solid choice for Logistic and Transportation websites that need power and flexibility. Present your best offers in a form of a breathtaking presentation, an intuitive slider will spice up the look and feel of your website. Moving Help theme now comes with Appointment Manager plugin help your visitors can use appointment booking to enroll for consultation from every device and any location. Cherry services plugin allows to showcase all the types of moving that you provide, you can display them on the homepage by means of a shortcode. Each service has an informational page where users can learn about it in detail. The Awesome Dropdown menu lets you present your website in a creative, thoughtful hierarchy. Guide your users by the hand as they peruse your visual experiences. Creative navigation styles make your website stand out and get noticed. Your visitors can sign up for a Mailchimp Newsletter about company events, new products, special offers and other discount information. Try Moving Help today! 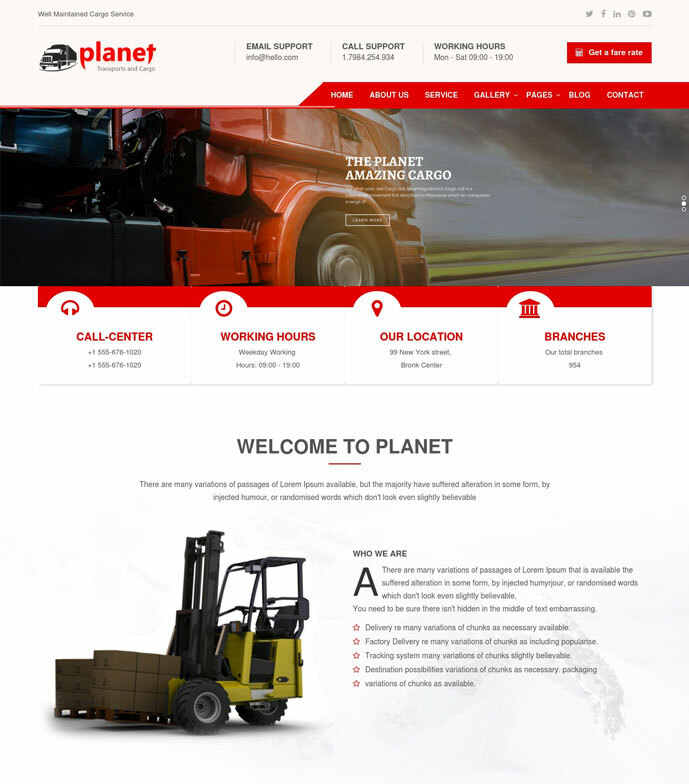 The Planet theme is going to be a solid choice for any logistics, transportation or trucking services out there. You currently counts with 10 professionally designed demo layouts for a range of niche applications, but the list is constantly expanding. Furthermore, the premium Visual Composer drag and drop page builder and the elegant Revolution Slider premium plugin are both provided for you to effortlessly style any demo or template page to suite your visual, graphical or branding needs in an intuitive, speedy fashion. You’ll instantly find a way to appreciate the inbuilt calculator that visitors can use to calculate estimated costs for delivery services, the calculator form lets visitors specify direct dimensions of the package, including its weight, and the distance that it needs to move to the final destination. Planet is very mobile and touch friendly, natively search engine optimized and remarkably fast loading, meaning it’s easy on your server loads, making use of minimalistic HTML5 and CSS3 coding as well as cutting edge LESS coding. In addition, the installation process was greatly simplified. With just a single click, you will be able to import every piece of relevant data. Planet theme layout is entirely responsive and Retina-ready, capable of displaying content on tablets, smart phones, desktop computers, and laptops. For more information about this WordPress business theme, be sure to check out its live preview. For those who wish to create incredible local delivery service or logistics company websites, MoveCo is an ideal choice. MoveCo is a powerful and ductile solution for webmasters far and wide across all spectrums of skill, experience and website nature and purpose. That is because MoveCo has been conceived with an immense amount of room for creativity and innovation and MoveCo includes both the Visual Composer Page Builder and Revolution Slider premium plugins, free of charge will help setting up your own online logistics website in a matter of minutes without ever having to write a single line of code. MoveCo is built on top of the Redux Framework, WordPress’ most advanced framework for theme options to make quick changes without diving into the coding. 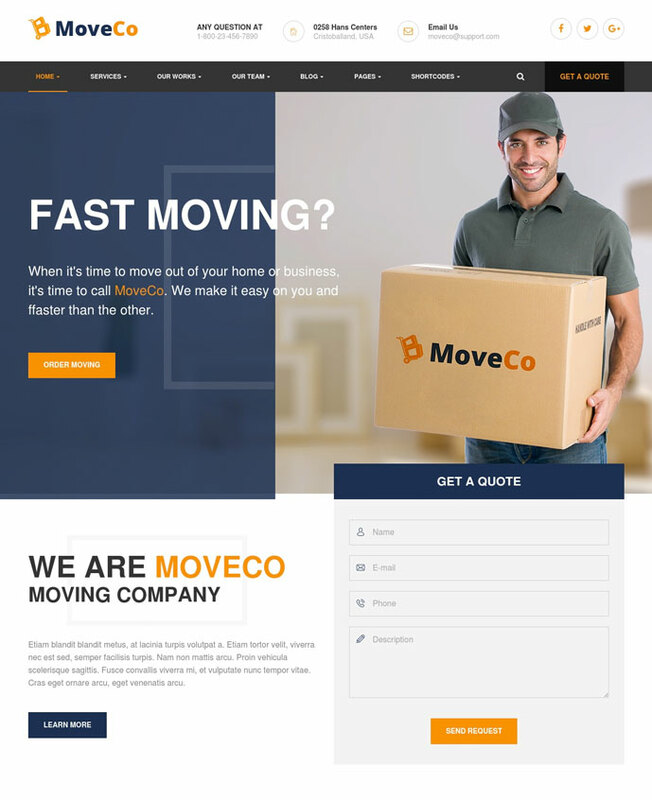 MoveCo theme is created using valid HTML5 and CSS3 code and loads really fast. Ultimately, this theme is fully responsive to provide your target audience a great user experience no matter what kind of device they prefer to use. The installation process has been simplified, thanks to the implementation of the one click demo installer. This great tool is Google Maps integrated and open to social networks share buttons. It is also Contact Form 7 and Bootstrap compatible. 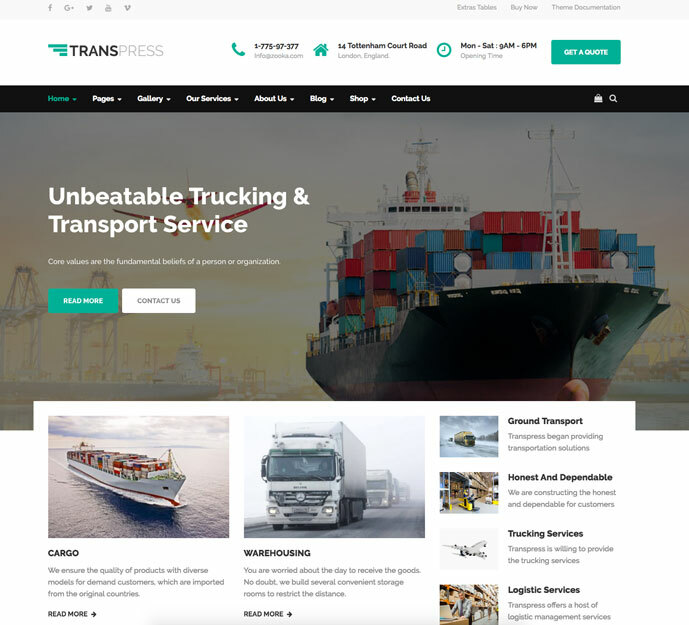 Transpress is a clean and fresh-faced, robust and reliable, competent and professional, technologically advanced and incredibly flexible, HTML5 and CSS3, easy to use and highly responsive WordPress logistics and warehouse services website theme. Transpress is an excellent theme for handling one page websites, as its streamlined trim and navigational experience translate deftly into one page designs, plenty of which are included with Transpress out of the box and readily available. Transpress has extensive technological capabilities, with wonderful widgets like the Slider Revolution, MailChimp, wooCommerce and Translation Ready, the Visual Composer tool, MegaMenus, and a wealth of in-house developed Live Customizer options to thoroughly adapt your Simple & Elegant website to suit your graphical and branding needs in no time at all and requiring absolutely no coding. Running your own Transport and Logistics website is easier than ever with Transpress, and when you factor in Transpress impressively SEO enhanced codebase and its superb search engine performance, it’s clear that this modern, ambitious theme is a strong candidate for servicing absolutely any business website out there. It requires no code modification, making it more accessible to users who lack programming knowledge. Try Transpress today! Max is a Creative and Modern WordPress theme for Cleaning and Moving company. This theme built with HTML5/CSS3 technology and latest Bootstrap framework so work well with all devices and screen sizes. Max has added the Visual Composer and Slider Revolution plugins, free of charge. It facilitates page construction, as it only takes a few moments to design something that can impress visitors. The theme offers awesome theme customization options such as Unlimited color options, parallax image support, video scrolling sections, custom logo upload, unlimited Portfolio and Blog layouts eye-catching header, built-in sliders that you can turn on for your target customers. Max suitable for any corporate websites in this field like Maid Services company, Home and Building Maintenance company. 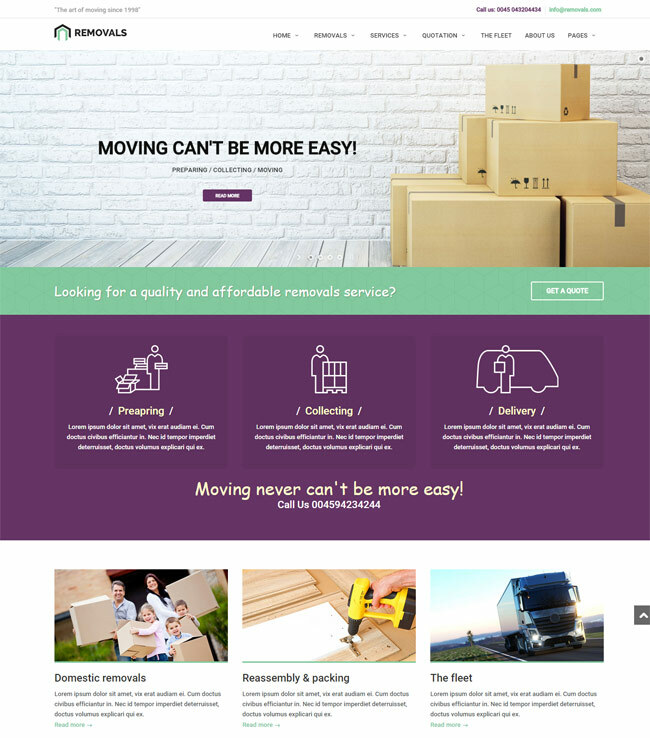 MoveIt is a modern, clean, fully responsive WordPress theme suit for Movers, Storage, Courier Services Business and all type of Moving Company related service. MoveIt is a beautiful, unique and thoughtfully comprehensive theme created exclusively for Webmasters with or without previous coding experience to effortlessly put together sophisticated, advanced business website for Moving Companies, within minutes, and without having to write a single line of code yourself. Because it is included with Visual Composer Page Builder and Revolution Slider plugins, the customization interface is just drag and drop ui elements and layouts. The Import demo content function help you reconstruct the prototype of a demo version with just one click. With two color schemes, light and dark variations and video background, you will always find the right demo to frame your website’s intent and purpose. 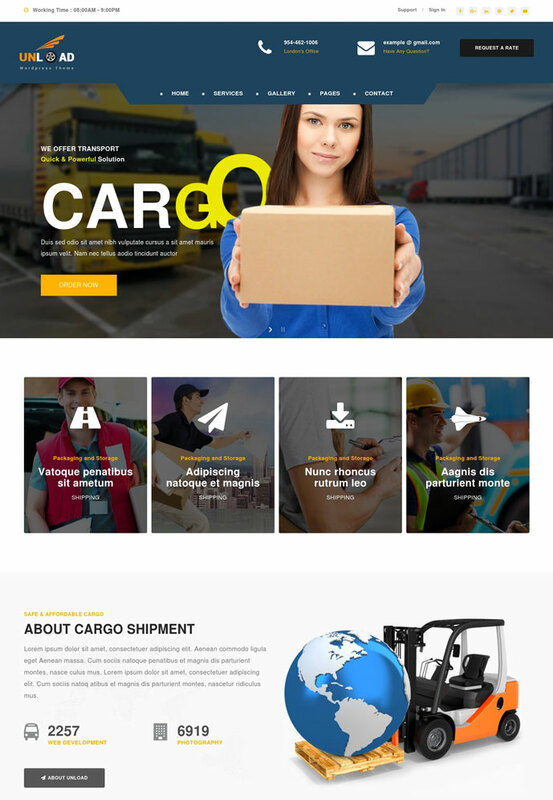 Cargo is a transport, logistics & home movers WordPress theme with focus on shipping, delivery and storage service providers and companies. It is fully Responsive, Retina Ready and Easy to customize. Cargo offers customizable quote calculator, unlimited project portfolio layouts based on grid pattern, three different tile / grid blog layouts, page transitions and distinctive typography. It also includes easy to use and fast page builder. Cargo adapts to every device, from smartphones and tablets to desktop. 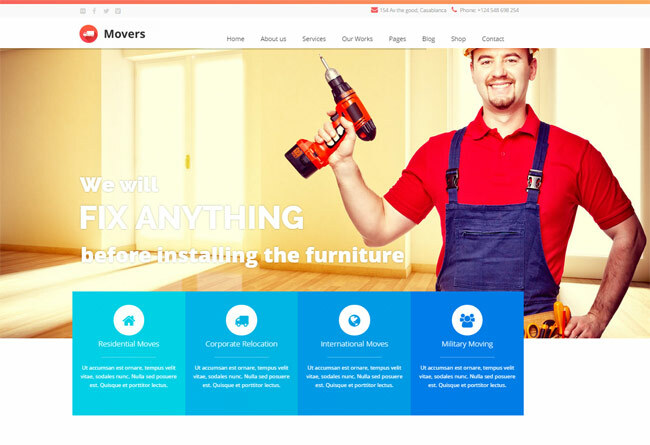 Express Movers is a Responsive & Retina WordPress theme. Express Movers WordPress theme is loaded with features, and has powerful customization options. Built with Bootstrap Framework. Express Movers theme aimed for moving service or transportation company. It’s very quick to setup and easy to customize. Transcargo is a Responsive WordPress theme using intuitive Drag & Drop Visual Composer and Theme Options panel in WordPress Customizer great for transportation and logistics business. Transcargo covered all necessary functions and abilities for transportation business website. 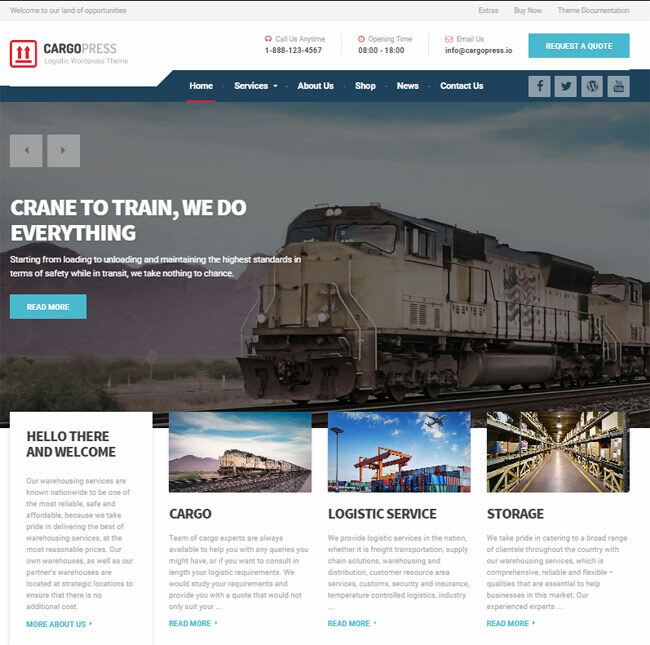 CargoPress is a best premium WordPress theme for transportation, trucking freight, and logistics businesses. CargoPress is easy to set up and use. It provides a simple roadmap to create a great-looking website, so you can get back to what’s most important – your business and clients. MovieIT Pro has been retired and is no longer on sale or supported. Thanks for suggestion, I have replaced it with Moving Help theme. I hope it is a worthy replacement for MovieIT theme. I bought / installed the Mover theme and it did not ship with the demo layout. Importing that did not work inside WordPress either after many attempts and time spent reading support docs and comments. Support was abysmal (received no support) so I refunded. Wish I would have not wasted my time (a week+) on that theme and gone with any of the others. Not happy with your experience with Mover theme, We select it with the criteria as the modern design, the features and plugins included to it. The After-sales support is a need of the times, we have reviewed the reviews on Themeforest and decided to remove it from the list and proposed MoveIt theme to list. Thanks for your comments, I hope you will be satisfied with new list.